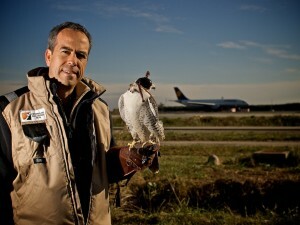 I was looking through a magazine one day and I saw a picture of a guy with a falcon at Barcelona airport and thought, “What a boring photo”, but also realised it was a great story. I got in contact with ‘Doc’ my writer friend who I work with and set the wheels in motion, it was an easy pitch to the magazine so all that was needed was to get through any bureaucracy at the airport. This was as slow as I expected it to be but not as difficult. As I suspected the world we encountered there was nothing like what would would of expected. Far from being ‘One man and his bird’ We found a whole team and maybe 80 different types of birds in a special compound situated right in the middle of the runways. I got a lot of shots that day and may include more in this entry when I can find a way to do it I like, but for now I am using this one because I like the element of humour, the way the bird is seemingly looking at the incoming plane. I also quite like the lighting, I was using flash off camera and the slightly theatrical, almost studio look belies the fact that it was rather windy and quite chilly. I very interesting day and one of those shoots you could easily turn into a project, as we had precious little time and I know there is a much more in depth story there waiting to be covered.